Elizabeth Garrett died 284 years ago today in 1725 at age 73 in Hartford, CT. Betty is the boys' 10th great-grandaunt, the sister of Anna Garrett, born in Hartford, CT in 1644 Anna married James Tappin, Sr. and begot Anna Tappin in 1662. Anna married Thomas Ward, Sr. and are the boys' 9th great-grandparents. 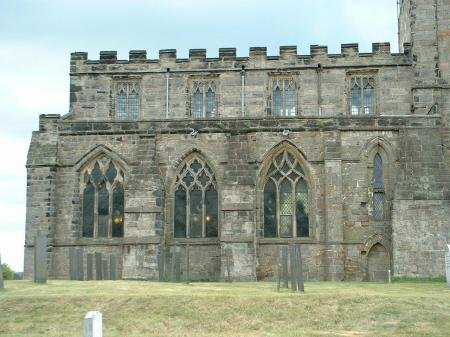 They begot Thomas Ward, Jr. in 1684 and he married Rebecka Birnham and they begot 6 children with Rebeckah Ward being the 4th born. Becky married William Cotton in Middletown, CT September 22, 1742 and are the boys' 7th great grandparents. William Cotton is the son of Samuel Cotton and Experience Hall. Francis Shirley is 496 years old today, born in 1515 This is one of the boys' oldest relatives. Even though the name line is short, in reality there are 11 Cottons in this line. Francis is the boys' 13th great-grandfather. Born in 1515 and died on July 27, 1571 Francis lived to be 56. He married Dorothy Gifford (1520-1571) and together they begot Elizabeth Shirley in 1540. Elizabeth married Thomas Cotton and begot Andrew Cotton. Andrew married Joane, and were Steve's 11th great-grandparents and the parents of William Serg Cotton (1610-1670) who we talked about recently. 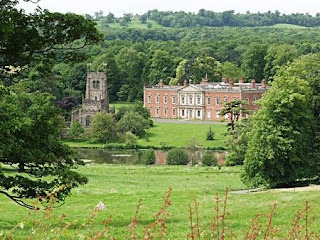 The following pictures are Staunton Harold where Francis was born and Breedon On Hill where he died. James Monroe Brown is 191 years old today, born in 1820 James is the boys' 4th great-granduncle and the father of funk music. Actually James is the brother of Resin D. Brown who was Charlotte Brown's father and who, with Rachel Earnest, raised Lottie Ray when Charlotte died. Marium Luticia Williamson died 81 years ago today at age 82 in Leon, Butler, Kansas Marium is the wife of the boys' 3rd great-granduncle, Henry Marshall Cotton. This is interesting, so bare with me for a moment. Ira Cotton and Sally Gold begot Samuel Cheney Cotton. Samuel and Almira Walker begot Hubbard Cotton, Helen Marshal Cotton and Henry Marshall Cotton. Henry Marshall Cotton and Marium Luticia Williamson begot 6 children all of which are the boys' 1st cousin's 4 times removed. The 5th child is Elmer Morton Cotton who begot 3 children, the youngest of which is Sharon Cotton, the woman who contacted Mom about our family and got me started on all of this a couple of years ago. I still email her on a regular basis about the family. I think they live in Kansas. Sharon married a Hohlfeld and is Sharon Hohlfeld. She is the boys' 2nd cousin 3 times removed. Otis Garrison died 103 years ago today in 1908 at 10 months old in Morgan, Alabama. Otis is Steve's great-granduncle, the brother of Sarah Eloise Garrison, Steve's great-grandmother who married John Wesley Reeves, Sr June 25, 1932 in Athens, Alabama. Otis, Sarah and Johnnye Douzie Garrison are the children of Samuel Omar Garrison and Lula May McCutcheon, Steve's 2nd great-grandparents. Sallie Mildred Bagley is 101 years old today, born in 1910. Sallie is Bryan and Andrew's grandaunt, the sister of Sudie Seay Bagley, their grandmother. Sallie married Charles Atkinson Garden September 24, 1937 and begot Clare Hethorn Garden and Mildred Bagley Garden both the boys' 1st cousin's once removed. Clare married Laurence Beckley Maddison April 30, 1966 and they begot Sallie Purrington Maddison in 1967 and Laurence Beckley Maddison in 1969. They are the boys' 2nd cousins.